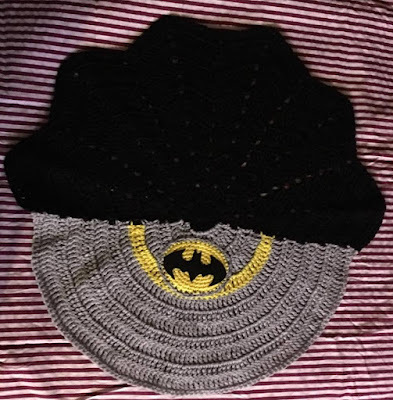 I am loving how it turned out in the end after all the trouble I had with trying to make a Batman stuffy shaped head. I decided to scratch that and just settle for the emblem. 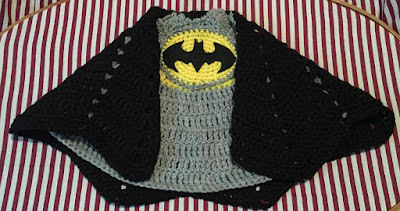 I crocheted an oval and then by using felt cut out the bat shaped symbol and adhered it to HeatnBond creating a patch to iron onto the gold oval. It worked like a charm! 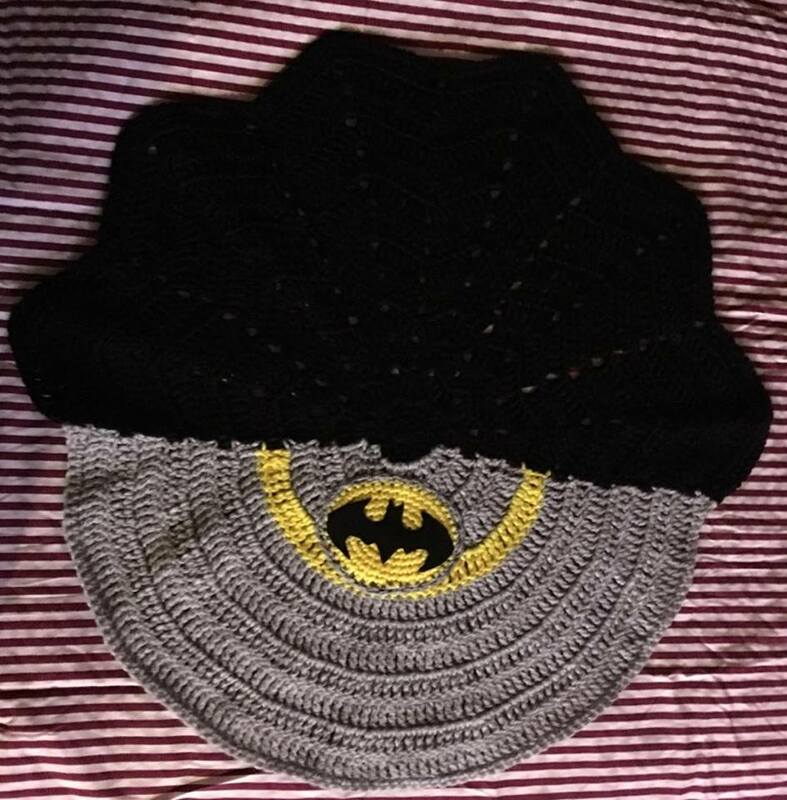 Stay tuned for pictures of the upcoming batman ensemble on a real live newborn baby! New Anything Goes (AG) Challenge started today, head on over to http://ttcrd.blogspot.co.uk/ for a chance to win wonderful crafty prizes! You know how to make me smile! Give me a beautiful image to color, some time to myself and card making supplies! I am a happy girl! 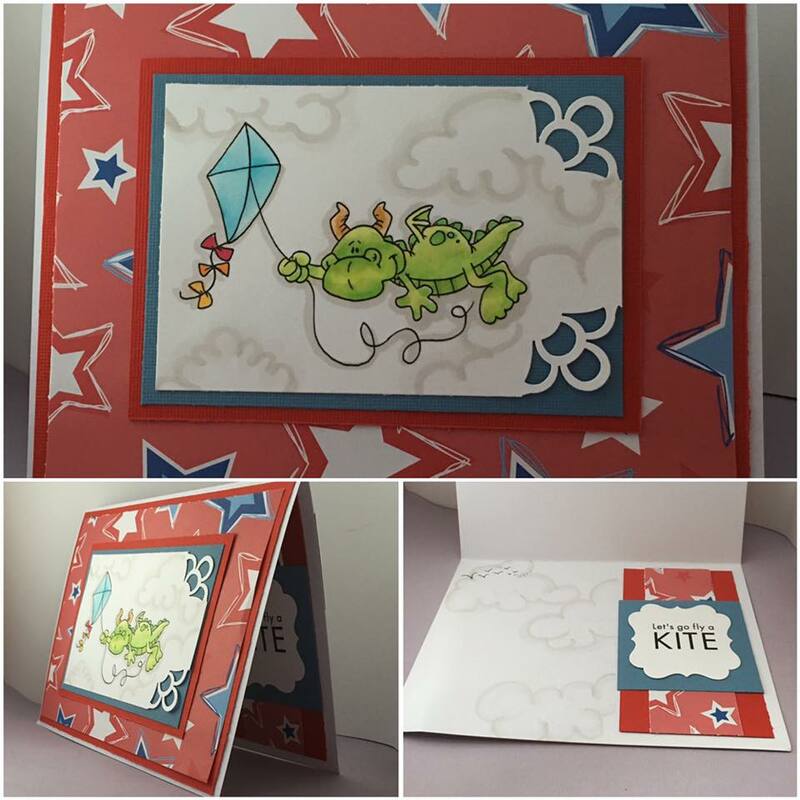 Today I made this card using up more awesome scraps from my scrap box, and playing with a few die punches. I have been trying to be more creative with backgrounds in my images. On this design I used a flower die punch, and some distressed ink to give the illusion of flowers in the foreground, then with what I call the speckle technique I added in some grass, hand drawn in some clouds and speckled some shades of blue for the sky, topped it off with a flock of birds in the distance. I look forward to mailing her off to someone special! 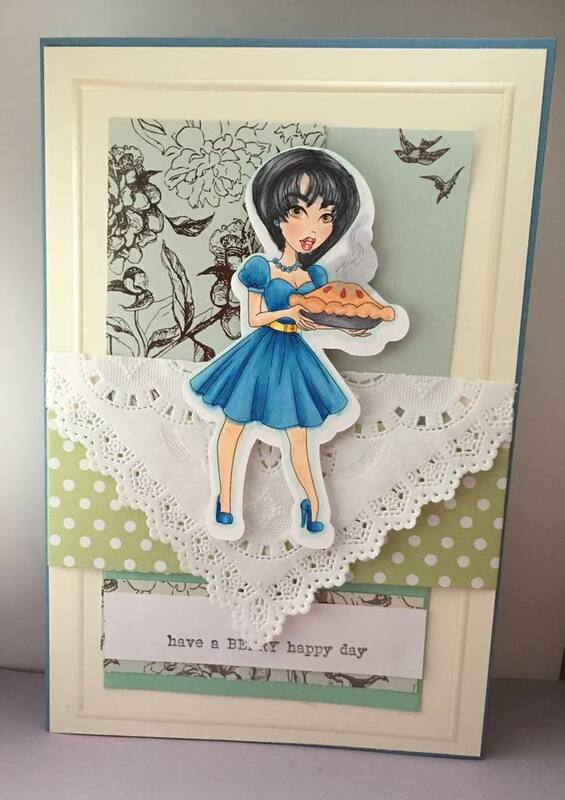 I started this card yesterday sifting through my scrap box for paper designs to go together in complimenting shades of summer time. I used my Copic markers to color the images, I added some sparkle to the the flower and the water pouring from the watering can. 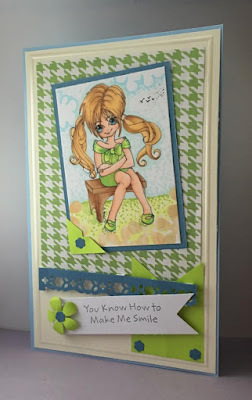 I used my Cuttlebug and a decorative folder for my embossed background and the yellow stripe across. 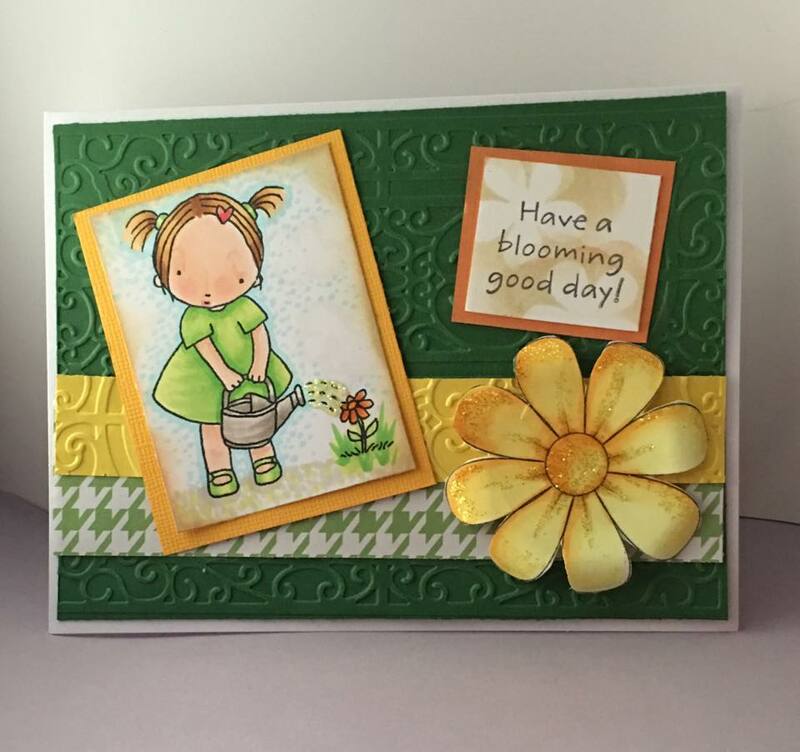 Using a flower punch I created a stencil to use on the greeting to give it a hint of blooming flowers. Finished it off with some distressed ink around the edges of the image. Today I needed a card for Father's Day. I remembered my father showing me how to fly my first kite as a child so I picked Dragon Kite Flying as my image for this card. I hope he likes it! Happy Father's Day to all the Father's out there! Today I made this card using Sassy Studio Designs image. I just found out that Sassy is closing her doors and will not be providing us with her amazing talent no more. This is such sad news as I love her images! Here's to you Sassy girl! Thank you for all of your hard work and providing us with such amazing images to play with!